Pseudo-intellectualism is way more fun than the real thing. When you're a fraud, as I am, you can still gorge yourself on intellectual ding-dongs such as country music and Go Fug Yourself. 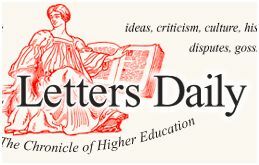 When my brain looks for healthy fare, it noshes at Arts & Letters Daily, a web portal that tracks interesting books, essays and articles that are all sort of au courant. Then when I've had my fill of intellectual snobbery, I take a breather at The Smoking Gun, where I can be first on my block to find out which celebrity has been arrested today.